When Kazimir Malevich first exhibited his non-objective paintings called Suprematism in 1915, they shocked both his painter friends and the art critics. Curiously, his friends understood them and were amazed by Malevich’s courage for having abandoned objects, but the critics were scathing. To exhibit paintings made up of nothing but squares and rectangles was considered an insult to the art world, and to themselves in particular for what they considered to be pure mockery on the part of the artist. But then, art critics had become known as the “grave diggers”, so their attacks were to be expected. That his painter friends understood these some 39 paintings means that they had a meaning and a content that was familiar to them, something that was “in the air”. What was in the air had been expressed by Vasili Kandinsky in an article of 1913, “Pure Art”, where he wrote that modern “art is no longer about what we see but about how we see.” By how we see meant how the eye sees, and this refers directly to the activity of the eyes when affected, first of all by light, and secondly when looking out into the world. When affected by light, the eyes see colours. When looking out into the world the eyes see all objects first of all as planes; seeing spatially is a learned experience, together with the seeing of objects. So how the eye sees refers initially to what was called “primary seeing” by physiologists: in pure seeing, we see colours and we see planes. In Suprematist painting of 1915, Malevich was capturing pure, primary seeing, seeing that is in the eyes when they are affected by light: colours and planes. This Suprematist seeing is the painting of a direct relationship between light and our eyes, a rather marvellous thought and experience. 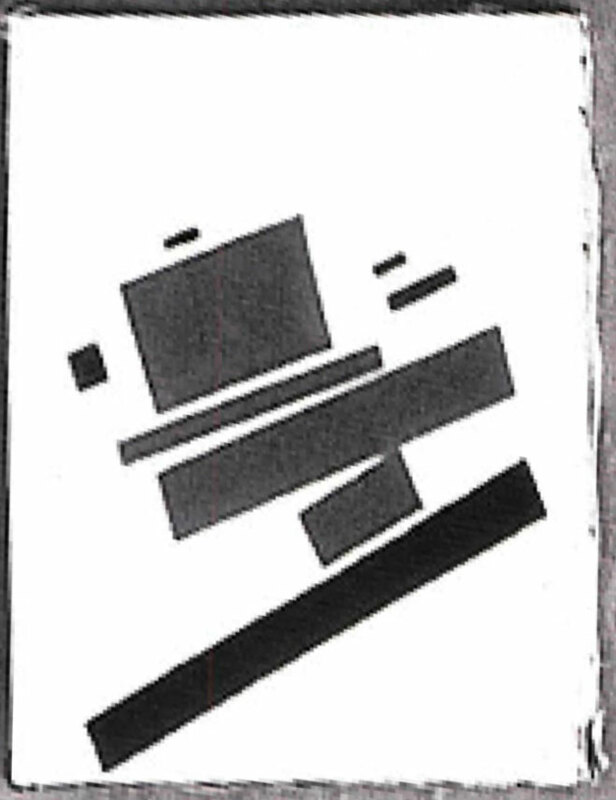 What was so innovative in Malevich’s 1915 Suprematism was that he was able to capture the “how” of seeing by understanding the laws of seeing itself. By focusing on the seeing of colours and shapes in his eyes when stimulated by various conditions of light and shadow, he became immersed in a world of colours, shapes, and their movements, and they were all taking place in his eyes’ visual field. This is what he was painting: he was painting coloured shapes in light which he called “colour masses”, the term used by physiologists for these phenomena, which then inspired Malevich to title his works, “Pictorial Masses”. 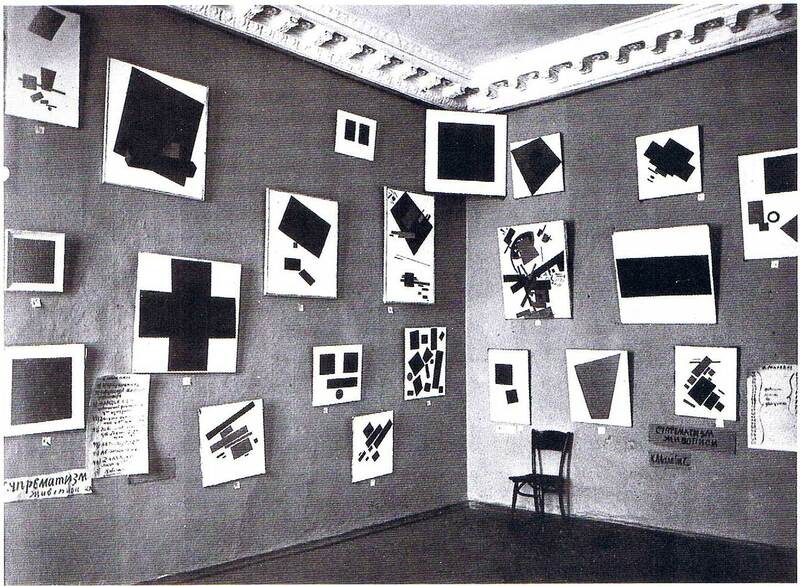 These optical phenomena were not random events, and Malevich made this clear in the way he grouped the paintings shown in the Last Futurist Exhibition of Paintings 0.10, held in Petrograd in December 1915. In the catalogue, he specified two main classes of paintings: Pictorial Masses that were “static”, “at rest” and in “two dimensions”, and Pictorial Masses in Movement and in the “4th dimension”. By “static” was meant the eyes were static, still and at rest, looking directly at something and seeing in planes, in two dimensions. By “in movement” meant that the eyes were moving from one place to another, with “the 4th dimension” referring to the changes of colours and shapes that occur in the eyes as the optical effects fade, called fatigue, as the stimulus weakens. Since this takes place “in time”, Malevich linked this experience to the notion of the 4th dimension. This painting has been thoroughly examined by two scientists: NIcholas Eastaugh (London) of December 2008, and Maria Kokkori (London) of February 2010. The pigments found by both scientists are vermilion, cobalt blue, zinc chromate (zinc yellow), zinc white, and carbon black. Planes which were painted over by the artist were recorded in an x-ray photograph by Maria Kokkori, who also discussed the canvas as it is pulled over the stretcher. Neither scientist continues to be regularly engaged in the investigation of Russian Avant-Garde art today. Among the Pictorial Masses in Movement is a painting which can be seen in the installation photograph, No. 50, hanging on the left underneath the Black Cross. It was also included in his Moscow exhibition of March 1920, Kazimir Malevich – His Path from Impressionism to Suprematism, where it can be seen on the bottom row, second from the end on the left. It was hung upside down, and although the two paintings appear to be different, they have been turned in the two-dimensional plane by a computer engineer and when they are photocopied on tracing paper and lain over each other, they line up with perfect precision. They would thus seem to be the same painting, despite the fact that the way the canvas has been pulled around the stretcher may indicate they were different paintings but which the painter could have adjusted between the two exhibitions. There is a notable difference between the photographs of the two paintings, however, in the fact that the rectangular plane in the Moscow photograph appears to be of a light colour, while this same plane is dark in the Petrograd photograph. It would thus appear that Malevich either changed the colour of these planes between the time of the two exhibitions, or he produced an exact copy of the 1915 canvas but using different colours. The purpose of this can only be speculated upon, and will be discussed below. Now the 1915/1920 painting(s) seems to have been lost, but what does exist is a variant belonging to a private collection. 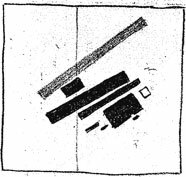 It, too, was photocopied on tracing paper and lain over the 1915 painting and shows sufficient differences in the relationships of the planes to confirm that the extant painting was not the painting exhibited in 1915 and 1920. This brings up a number of questions about Malevich’s creative practice. For there are variants of many of his compositions in which he was exploring aspects of pictorial, visual ideas; the hundreds of drawings are proof of this. This variant, however, may have come about for several reasons, one of which could be because the 1915/1920 painting(s) had been lost or, on the other hand, it may have preceded it and been the original version of the composition, with the exhibited painting being the variant. The thoughts below explore what can be learned from the painting, and this may contribute to a further understanding of Malevich’s creative practice. Every one of the Suprematist paintings of 1915 depicts events of optical colour masses seen in the eye’s visual field, and they may also be related to objects seen in that visual field. So every painting must begin with a starting point of this experience. 5 • The 1915 painting with a dark-coloured plane, reversed. 6 • The 1920 painting with a light-coloured plane. In the paintings of 1915, Malevich always began with his initial point of seeing and he designated this in the painting by a square, the centre of vision, or a circle which he called his “points”. In the painting in the private collection, this square is red and quite small and it is placed at an angle in the middle-right of the canvas. This would be the artist’s initial centre of vision, his point of focus on something. Stimulated by a chosen condition of light and the objects that may have been present, the planes of colour and light would appear in his visual field from which he captured them first as a drawing and then as the paintings. The arrangement of the planes and the colours in the extant painting should be read as follows: from his point of focus, the artist moved his eyes to his left where he captured a large rectangular blue plane or mass of colour. He then raised his eyes and, in sequence, saw a short, narrow yellow band, then a long black band, a short red rectangle, to finish with an even longer black band. Next to the blue rectangle he caught glimpses of small, short dark bands, while a small bright yellow one lay underneath it. This process was determined not only by the angle at which he was raising his eyes but also in raising his head, always on the diagonal to the left. This is the basic structure of the composition. 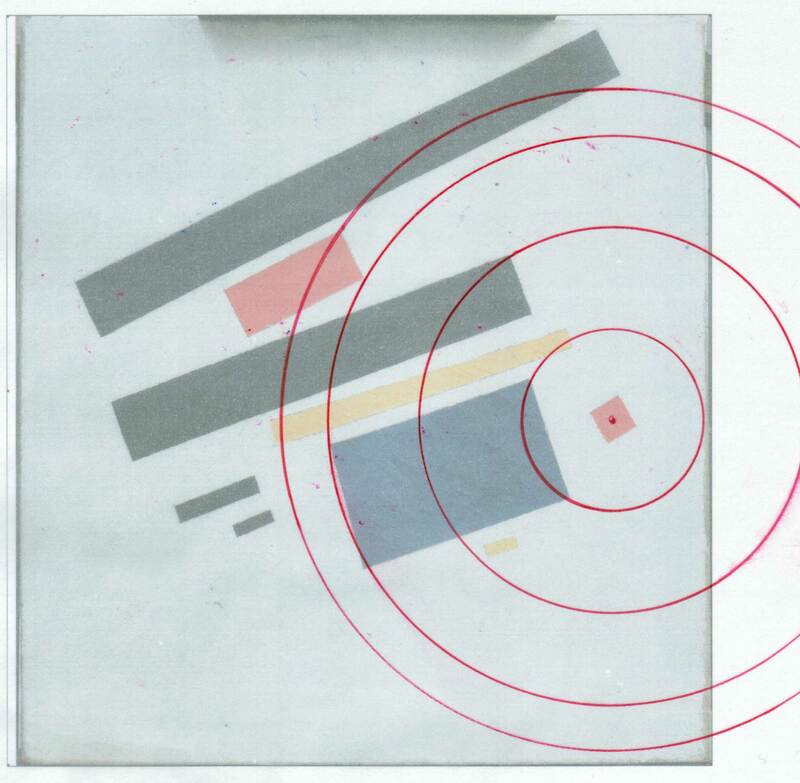 8• K. Malevich, Drawing for Pictorial Masses in Movement, 1915. The geometrical diagrams drawn onto the three compositions are based on how objects and colour masses may have lain in the optical visual field. The structure begins with the square and it is at the centre from which direct seeing takes place. 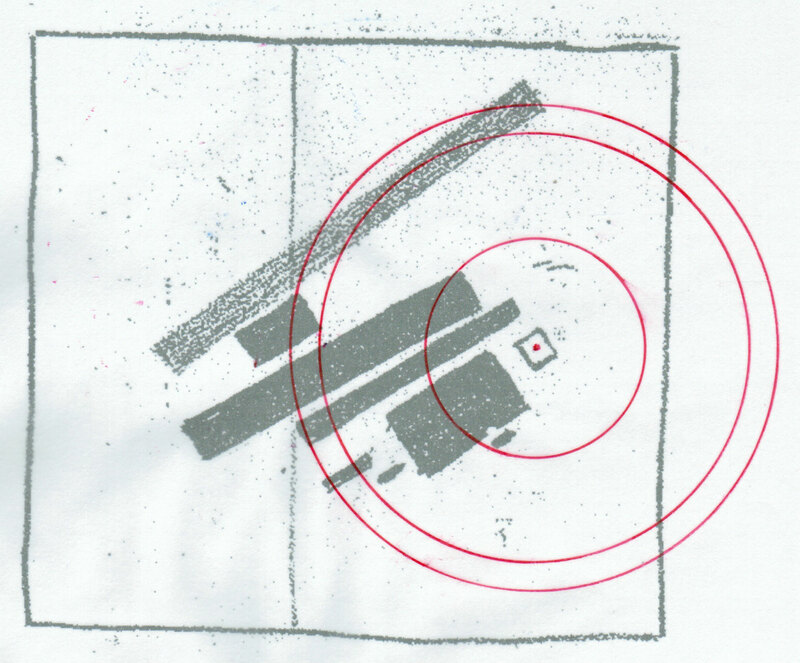 The eye being a sphere, the planes captured show the positions at which they lie in this field on concentric circles. They are interconnected, necessarily, and Malevich applied this orderly structure by having planes fixed from their corners and along edges as they meet. Thus he created a stable structure and one that corresponds to how the eye sees such planes in its visual field. What is important, of course, is that the structures of the drawing, the extant painting, and the painting that was hanging in the 1915 Petrograd exhibition are based essentially on the same relationships and interconnections, which displays the unity of the visual field. 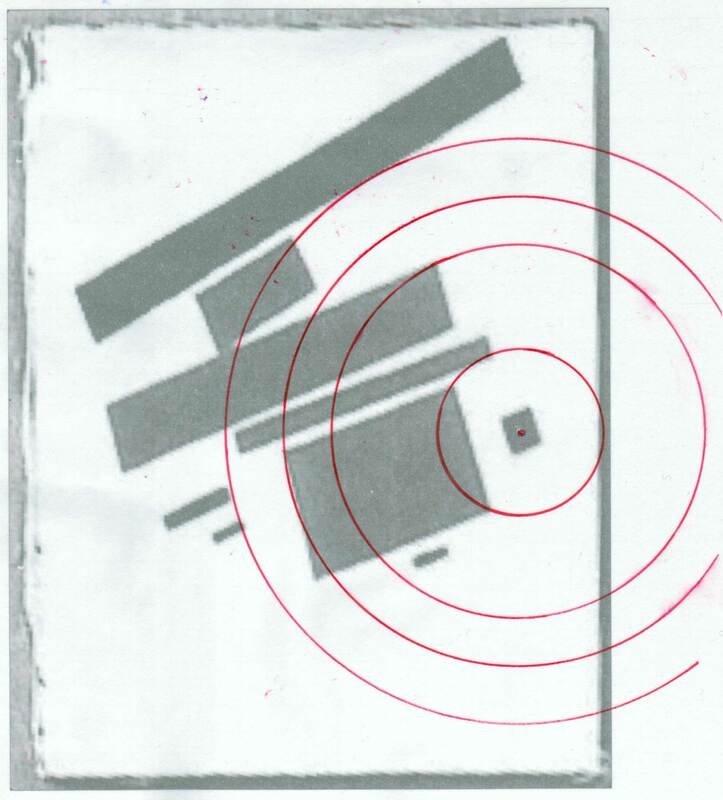 This is barring the odd shift of a band and the spacing between the elements, and the slight deformations due to the necessity of turning the Petrograd picture from the angle at which the photograph was taken. All three of these works display slight differences in the colours Malevich was choosing for the various planes. In the drawing the long band across the top is stippled so it was seen as an intermediate tone, neither dark nor light. The square is uncoloured, white. In the Petrograd version, there appears little differentiation in the tones of the planes so it is nearly impossible to speculate on what the colours might have been. It is clear, however, that the large rectangle at the bottom was of a dark colour. 12• Geometrical Diagram of Pictorial Masses in Movement, 1915, exhibited at Last Futurist Exhibition of Paintings 0.10. In the Moscow version, the large rectangle, now at the top, is of a light colour and this becomes evident when compared to the painting that hangs above it, today in the Museum of Modern Art in New York, whose partial ellipse is pale blue and the square above it is a pale pink. The only colour that appears in black and white photographs as a light tone is usually a bright yellow. Then, there is the extant painting of the Pictorial Masses whose rectangle is a strong middle blue, while the other coloured elements are red and yellow. Between them lie black bands, both short and long. 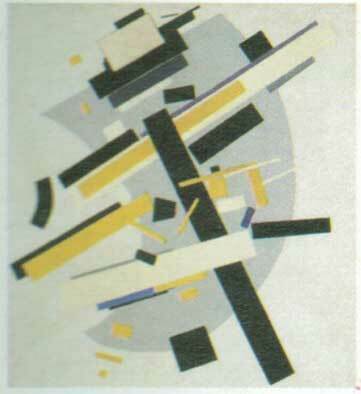 This painting captures nicely Malevich’s use of the laws of Suprematist colour in the paintings of 1915. Now red, green and blue are the primary colours of light and they are also the primary colours of the human eye, to become the primary colours of Suprematist painting. Malevich called them the Basic colours. In addition, the laws of the Complementary colours are phenomena of the human eye – looking at a bright red surface produces the afterimage of a bright green light in the field of vision (and vice versa). The same is true for the pairs blue and orange, and for yellow and violet, although depending on the tone of the violet it may closer to a dark blue ultramarine which is why Malevich indicated the complementary as ultramarine and lemon yellow. Finally, the pairs of white and black correspond to the optical juxtapositions of light and dark. These may also be afterimages, the eye so stimulated by light that it loses all capacity to see colours, and black appears in the visual field. Finally, Malevich often abbreviated the sequence of prismatic colours to the red and yellow which are at the beginning of the spectrum nearest to light, and to blue at the end of spectrum, nearest to darkness (black). These are the three laws of Suprematist colour and light and they are also the laws of the seeing eye: the three primary colours of light, the complementary colours, and light and dark. The extant, Pictorial Masses in Movement, was created according to these laws. 13• Hanging in the Moscow 1920 exhibition. The colours in the painting are red, yellow and blue, where the red and yellow make up prismatic sequences in light, and as optical sequences in the way colours shift in the eye during the fading of an optical colour. 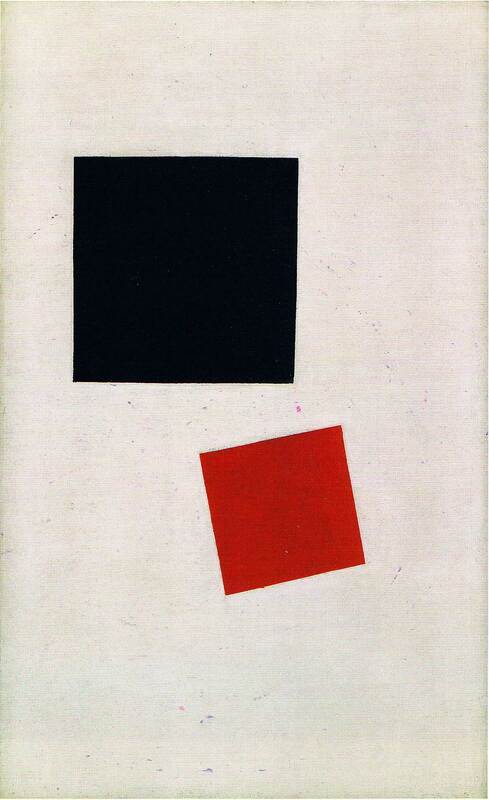 As Malevich began with a red square, it repeated itself in the small red rectangle, shifting to the yellow band as the light in his eye changed intensity. Then he placed the complementary blue plane next to it, the effect being to brighten both colours in the eye. But as blue is a transition to darkness, the long black bands appear as the artist looked up, all colour disappearing. Thus, Pictorial Masses in Movement is an archetypal arrangement of planes in which the laws of Suprematist colour are applied in a coherent manner according to the laws of light and of the seeing eye. Regarding the version of 1920 in which Malevich may have over-painted the blue rectangle in yellow (presumably), one can only imagine that he adjusted the other colours according to the same laws, but without the painting this remains an unknown. And why did he do that? As a colour experiment using the complementary colours, blue in one painting and yellow in the other? This, too, is but a speculative response. 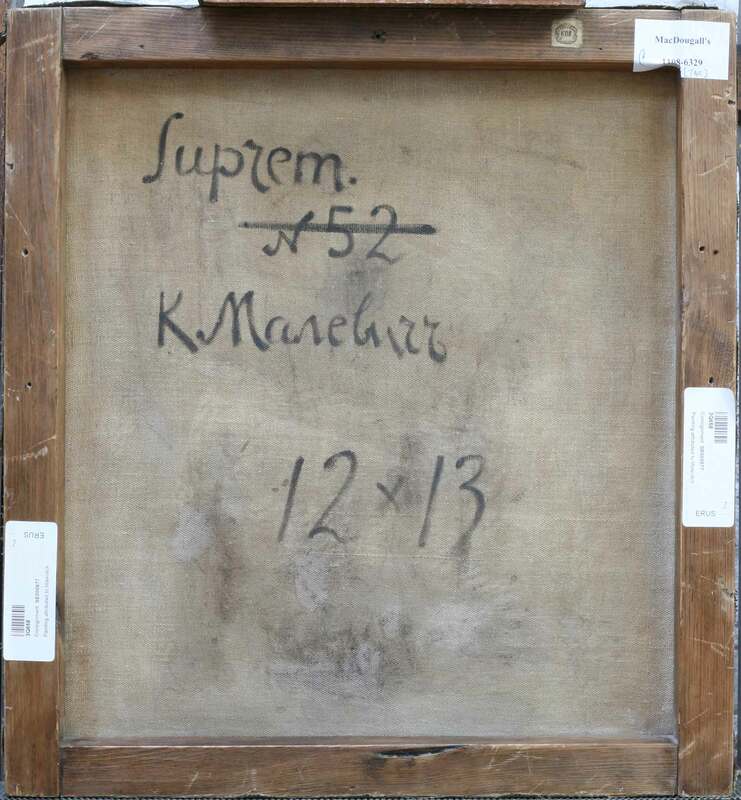 On the back of the canvas of the extant painting of Pictorial Masses in Movement, Malevich wrote, “Suprem N 52“, signed it and gave the dimensions in archin, “12 x 13”. These were his customary inscriptions (the No. and dimensions varying, of course) placed on works which he submitted to the Purchasing Committee of the Museum of Artistic Culture from around 1919. 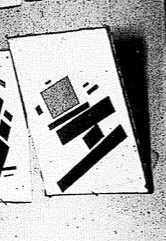 Similar markings are found on a painting that was bought for the Museum of Artistic Culture in Petrograd (today it is in the Russian Museum, St. Petersburg), as can be seen below. The similarities of the markings would suggest that Malevich had submitted the Pictorial Masses in Movement for purchase but which, apparently, was returned to the painter. 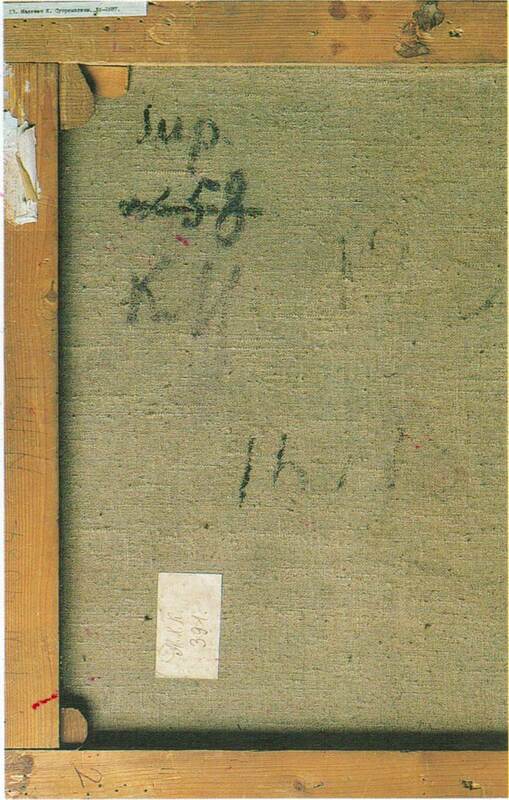 On Suprematist paintings of whatever period, it was Malevich’s habit to indicate its classification as “Sup” or “Suprem.” when he submitted a work for purchase, as can be seen on the Russian Museum painting. So the “Suprem.” on the back of the Pictorial Masses should not be considered as the title of the work, which was once thought. In the likely context that the Pictorial Masses in Movement was the painting that Malevich proposed in May 1920 to the Purchasing Committee, at the same moment that his other painting was being exhibited in Moscow (apparently the exhibition went on through the summer), Malevich was obliged to paint another version. 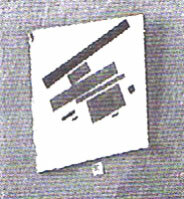 Or, what is also possible is that, due to having painted out two planes that can be seen in X-ray photographs, the extant Pictorial Masses in Movement may have been the original version painted in the summer of 1915; Malevich is known to have re-painted some of the summer canvases when he returned to Moscow, in preparation for the December 0.10 show in Petrograd. Either way, what may certainly be the case is that, given the inscriptions on the back of the canvas, Pictorial Masses in Movement was proposed to be acquired by the Museum of Artistic Culture and would have been at the same time that his one-man show was on view in Moscow. Hence he would have proposed the painting from the private collection so it may be claimed that its “Present whereabouts are now known”. 16• Back and front of “Sup. (No. 58)”initialled KM, dimensions “16 x 18”. 1916. The purpose of this article was not to argue for the authenticity of the painting since that has been done elsewhere. Rather the aim has been to acknowledge first of all that the two exhibited versions appear to be so different in colour and yet match each other structurally, and secondly to understand why there is more than one version of the composition. The fact that the artist was exhibiting one and submitting another for purchase at the same time may be the simple and perhaps most obvious explanation to the latter question. The case of showing a painting whose colours are different is an exploration in Suprematist colours but as the painting has apparently lost, this can only be noted and no conclusions can be drawn. For the history of Malevich’s painting practice, nevertheless, it is necessary to be aware of this since it could form a context should archival information appear. Most importantly, however, is that the Pictorial Masses in Movement in a private collection makes a significant contribution to our knowledge of Suprematism of 1915 and the paintings shown in the 0.10 show. For only about one half of those shown are visible in the installation photograph and only about one half of them are extant. 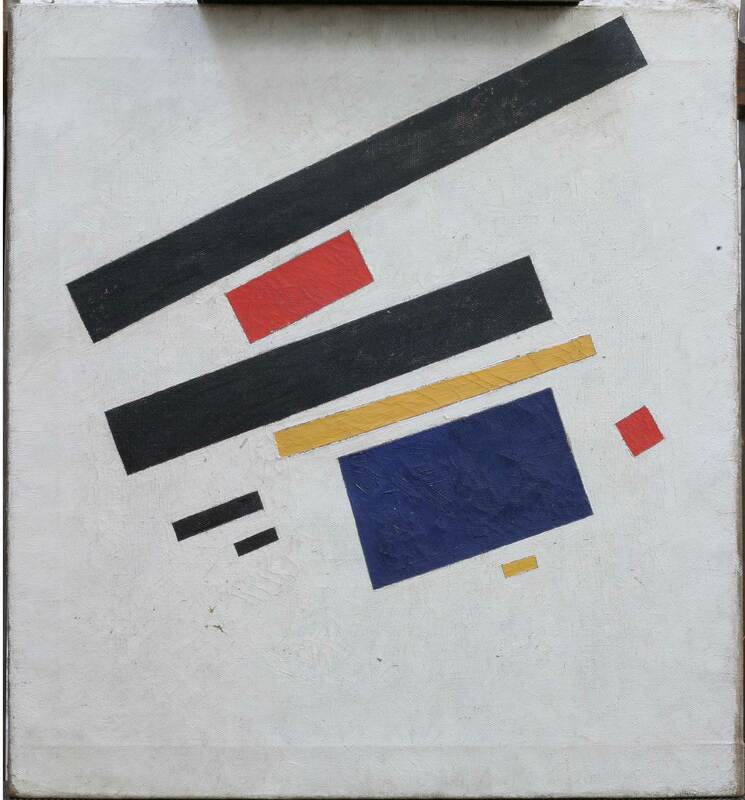 So this painting now becomes part of a small archive on the exhibition, as well as adding to what we know of Malevich’s theory and use of Suprematist colour.